(Nanowerk News) The question of whether or not nanoparticles have an effect on the human body – and if so, how – is still largely unanswered. There is little information, for instance, on whether pregnant women exposed to these minute particles pass them on to their unborn babies. Scientists from Empa and the University Hospital Zurich now show first results ("Barrier Capacity of Human Placenta for Nanosized Materials"). During the investigation polystyrene nanoparticles were injected into the mother’s blood supply. Scientists then observed whether these were able to pass into the baby’s blood supply. Nanotechnology is not only expected to help overcome existing challenges in the realms of medicine, energy supply and environmental protection; it is also considered one of the motors of innovation for the Swiss economy. This new technology will, however, only be able to establish itself in the long run if potential risks associated with it – such as those posed by free nanoparticles – are fully investigated and understood. Over several years, Empa researchers have been studying the effects of numerous nanoparticles on human cells and tissue. These investigations will help scientists to understand what problems – if any – these tiny things might cause when released into the human body (and in the environment). In a study recently published in the journal “Environmental Health Perspectives” scientists from Empa and the University Hospital Zurich have investigated a very special organ, the human placenta. It acts as a filter of sorts between a mother and her unborn child. Responsible for supplying the fetus with sufficient nutrients and oxygen, the placenta also ensures that the circulatory systems of mother and child do not mix. The researchers wanted to know if nanoparticles were able to cross the placental barrier. Both the mother’s circulatory system and that of the fetus can be maintained for several hours in the laboratory. Is it a tight barrier for nanoparticles? 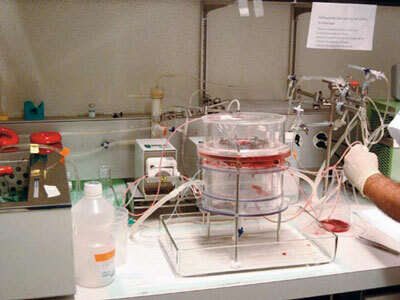 Established animal models, such as those for mice and rats, cannot be used for this purpose as the placenta in these creatures is fundamentally different from that of humans. Normally it is not easy to carry out scientific investigations on placental tissue, but several mothers who gave birth to their babies in the hospital agreed to allow the researchers to use their placentas for this study. In the laboratory it is possible to maintain both the mother’s and the baby’s circulatory systems (which are closely linked) for several hours in these donated organs. The investigation required the researchers to add fluorescent polystyrene nanoparticles to the mother’s blood circulation and then observe if they were able to pass into the fetal circulation. Polystyrene particles are particularly suitable for this kind of test as they do not cause stress in the surrounding tissue and are easily detected. The particles injected into the placenta were of different sizes, ranging from 50 nanometers up to half a micron (500 nanometers) in diameter. The first result of the study was that the cutoff size of the beads was between 200 and 300 nanometers. Particles smaller than this, crossed the placental barrier and entered the fetal circulation while larger particles were held back. The fact that particles below a certain size are able to pass through to the placental tissue to the fetus is not really unexpected, but the phenomenon must certainly be subject to further study, the investigators say. They are therefore keen to understand the mechanism, by which the particles are transported across the barrier – in both directions. They are not doing this purely for the love of research, though. They would like to determine how, in future, nanoparticles might be used for therapeutic purposes. The tiny particles could feasibly be employed as a vehicle to transport drugs in a targeted fashion to the circulatory system of an unborn child, without this affecting the mother’s health.